Original acrylic on canvas “Blue Poppy” painting 18″ x 24″ SOLD. 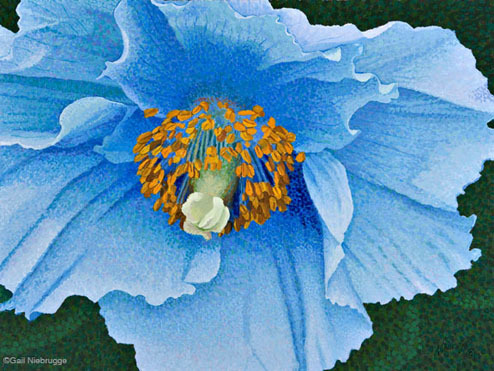 Artist Gail Niebrugge loves to garden and the Alaska climate is perfect for growing the Himalayan Blue Poppy. These perennials grow two to three feet tall and re-seed like weeds. Niebrugge’s studio garden is lush with these gorgeous blue blossoms during the summer. The original painting “Blue Poppy” is now available as an open edition art print of the highest quality, reproduced on acid free paper with fade resistant inks, each is hand signed by the artist. We want this print. How do we buy it.